Only 87 lbs. left in stock! This an outstanding Sumatra crop that was produced by only 120 individual farmers! This Sumatra Lintong is 100% Typica and produced by a small cooperative from the village of Saran Padang. The village is located south of Lake Toba within the Simalungun Region. The coffee is processed using the traditional semi-washed (wet-hulled) or Giling Basah method (see Additional Info below for more detail). There is no other coffee quite like a Sumatran coffee! Big in the cup, rustic, spicy, and complex. The aroma is amazing with hints of spice and cedar. The body is very full with notes of sweet caramelized sugar, a clean earthiness. Wood tones of cedar, spices and hints of black pepper are also present. The mouthfeel is substantial, yet creamy, and the acidity is quite mild. The finish is long and lingering. No other coffee offers such an intensely satisfying range of complex flavors and body. My personal favorite roast level for this Sumatra Lintong Tiger is Full City roast. However, it is equally as good at a Full City (+). In truth, this fine coffee has something to offer at all the roast levels. As always, we are always happy to accommodate any roast level you prefer. An intense choice with pronounced herbal qualities, notes of Graham cracker, and more of a dry nuttiness. Plenty of spice and character, with a more pointed finish. This is a good choice if you like an herbal and spicy quality in your coffee. This is the roast for experiencing the best balance between Origin and Roast characteristics. Offers a huge, deep body, with Baker's chocolate, cedar, spice, earthy aromatics, mild acidity, smooth, rich mouth-feel and a sweet finish. This is the roast level that really captured my attention. This is the go to roast level for that thick, velvety mouth-feel and juicy, deep body. Plenty of character with notes of cedar and spice. Silky smooth and deep! Want an even heavier body, notes of dark chocolate, syrupy mouth-feel, tempered acidity and herbal tones? If so, then this roast level is an excellent choice! This roast will provide a heavy, dense body, with profound bitter-sweet chocolate tones. Spice tones remain, but complexity is lost. Thick, heavy and rich! 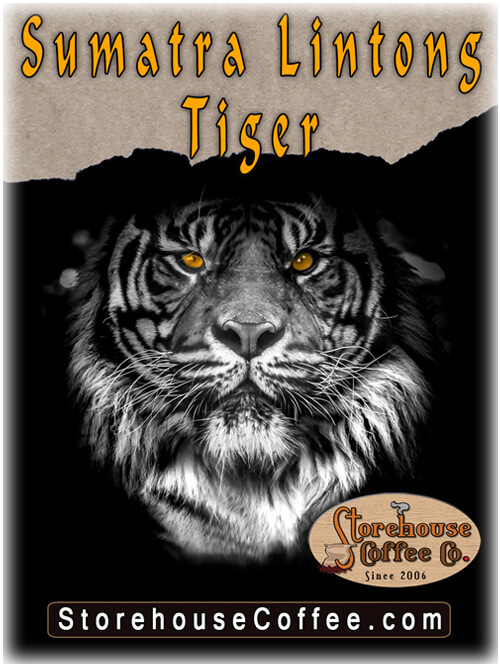 Sumatra Lintong Tiger is the highest grade of specialty coffee available from Sumatra: certified Grade 1, TP (Triple Picked), meaning it has been rigorously sorted by hand to remove any natural defects and ensure the best quality lots. The unique flavor profile of Sumatra coffee is greatly influenced by the way it's processed. Sumatra (and Sulawesi) growers are the world’s exclusive practitioners of the Giling Basah, or Semi-Washed (Wet Hulled) process. No other origins use this process. In the Giling Basah process, only the outer skin of the coffee cherry is removed leaving the mucilage on the parchment. With the parchment layer still intact, along with a good portion of the mucilage, the beans tend to be gummy and sticky, and the parchment will have a very high moisture content. The extra mucilage and moisture content profoundly alters the cup profile by providing more sweetness and body. The drying of semi-washed parchment is done on natural clay or dirt patios where the coffee beans can freely absorb characteristics and minerality of the soil, which in turn contributes to the classic, earthy profile of Sumatra coffee. Elevation: 2,500 - 5,000 ft. This coffee is one to remember. It satisfies on all dimensions. Friends who have tasted it ask me about it. I might try different coffees and still think "...and then there's that Sumatran..."
Reviewed by: Shea Zeiser from St.Louis.